Canada and the US have had a strong relationship over the years. Perhaps that is because the border between Canada and the US at 5,525 miles is the world's longest border between two nations. It is also the official home of Sasquatch (aka Big Foot) and reportedly is the origin of Paul Bunyan. Let's face it - it is difficult to find any American that does not like Canadians and the feeling seems to be mutual. This also holds true in banking. Here, Canadian banks just last year announced the investment of more than $9B in American banks. RBC (Royal Bank of Canada) took over City National Bank in Los Angeles for $5.4B and CIBC (Canadian Imperial Bank of Commerce) acquired Private Bancorp in Chicago for $3.8B. One key reason this is occurring is because Canadian banks survived the great recession in better shape than many foreign counterparts. They mostly stayed away from subprime lending and mortgage securitization and there were no big bank failures either. Meanwhile, many big European and US banks were forced to retrench to meet new capital requirements. At the same time, American banks had also to comply with new regulations. This provided a perfect opportunity for Canadian banks to expand into the US and that is what they have selectively done. Another reason for the move is that their own domestic market seemed less promising. Canadians are holding heavy debts, the earnings of the oil industry are plunging and delinquencies in credit cards and auto loans are growing. For decades, Canadians living in such a cold climate have traveled down into the US. Flights are plenty after all and the sun shines brightly in many of our states. Each year, in fact, wealthy Canadian customers known as Snowbirds flock to warmer weather in AZ, CA, FL, TX and other states during the winter time. In fact, more than 500,000 Canadians own property in Florida alone and they are a key investor in the US. 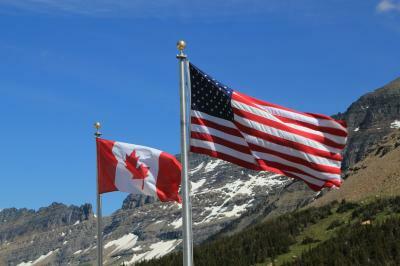 For community banks, Canadian visitors are all around you doing business all through the US. For their part, Canadian bankers are eager to get closer to American customers too. One reason is that there are 900% more of us than there are Canadians. That is why TD (Toronto Dominion) Bank for one is building a strong presence on the East Coast. TD has purchased several US regional banks, starting with BankNorth in 2005 and today it has 1,300 branches here. Given all of this activity between our countries, there is significant opportunity for community bankers. For instance, Census Bureau data shows the amount of import and export activity between our countries is nearly balanced and it is quite large. This means many of your customers are either importing or exporting things back and forth with Canada. That provides opportunity to significantly boost your international currency activity as you support your clients (call us and we will show you how easy this can be). It also means you may be able to get more loan business and customers from cross border partnerships. Talking about Canadian opportunities with your customers and helping them along can bear fruit in ways they may not be thinking about right now. That can boost your business and that is a good thing. Finally, these Snowbirds need to park deposits when they travel so having big welcoming signs both digitally and physically may get them to open up a deposit while visiting the US. There are many ways to do business with Canadian visitors and community bankers know what is going on in their communities - so you are perfectly positioned. What do you think eh? Yields moved slightly, up 1bp, as investors brace for the outcome of the European Central Bank (ECB) policy meeting. The latest FDIC supervisory insights report finds from 2013 to 2015, about 33% of all banks reported a total CRE or total agriculture concentration over 300% of total capital. Of these banks, the percentage with a 3Y growth rate in excess of 50% in either portfolio increased from 23% at year-end 2013 to 34% at year-end 2015. This percentage increased to 39% in Q1 2016. Research by the World Economic Forum on jobs finds issues that will impact industries and business models by the end of next year are: new energy supplies and technologies, the Internet of Things, advanced manufacturing and 3D printing, longevity and ageing societies, new consumer concerns about ethical and privacy issues, and women's rising aspirations and economic power. Research by the Society for HR Management finds the primary contributors that drive overall employee job satisfaction are: respectful treatment of all employees at all levels (67%), overall compensation/pay (63%), benefits (60%), job security (58%), trust between employees and senior management (55%), opportunities to use your skills and abilities (55%), organization's financial stability (53%), relationship with immediate supervisor (53%), feeling physically safe in the work environment (50%), and immediate supervisor respect for your ideas (49%). A managing director at Crowe Horwath indicates CECL is the "biggest change in banking" in 40Ys. BLS research finds 70% of what employees know about their job is learned informally on the job.